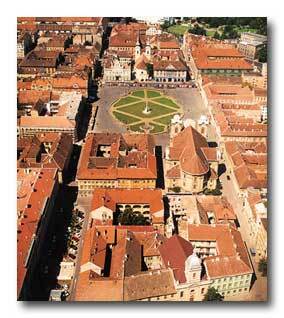 Timisoara is located in the Banat region in western Romania. Known in German as Temschwar and/or Temeschburg and frequently referred to as 'Little Vienna', Timisoara has always been a progressive, cosmopolitan city,facing West rather than East, so it was no surprise that the spark of the Romanian 1989 Revolution was ignited here. Other claims include the first city with trams, the first in continental Europe with electric street lighting and the oldest hydro-electric station in Europe. It is also a very beautiful city with open squares, parks and gardens, elegant boutiques, cafes and and restaurants and a wide variety of architecture, principally baroque, neo-classical and 'art nouveau'. The focal point is the tall orthodox cathedral standing at the end of the main square, Piata Victoriei, overlooking the Bega Canal. The square is lined with impressive late secessionist apartment 'palaces'. Across the town centre is the colourful, historic, Habsburg-era square, Piata Unirii, lined with pavement cafes, and colourful buildings which include the newly renovated, and very fine, newly-restored baroque Catholic Cathedral , and Baroque Palace which houses the city's art museum, together with a Trinity Column, the baroque Serbian Orthodox Cathedral, the mint green Serbian Metropolitanate and the extravagant art nouveau Banca de Scont. Many of the buildings around this delightful square are either being restored or are scheduled for restoration in the near future.